Dr. Bart Rossi PhD. is a political psychologist commentator that provides insights to stories in the news on TV and in print. He offers psychological insight to high profile news items in general, and politics in particular. He began his ‘on-air’ commentating with the introduction to MNBC by Karen DeSoto, an ‘on-air’ legal analyst at NBC News, and has since appeared on a wide range of television networks, including MSNBC, CBS, and FOX5, local television MY9, PIX 11, WHDT, and the cable news shows News 12: Power and Politics; and the EMMY-winning cable show The Fresh Outlook. In 2015 Dr. Rossi appeared regularly on WINK-TV (ABC Florida) ‘Campaign Central,’ and in 2016 became their political commentator. He has also appeared on radio shows such as The Wall Street Journal This Morning, the Alan Colmes Show on Fox Radio, the Jake Burkman Show, and WDUN Newstalk 550 in Atlanta, GA.
Dr. Rossi (see full resume of Dr. Rossi ) is member of the American Psychological Association, the New Jersey Psychological Association (former board member), and New Jersey Association for the Advancement of Psychology (former chairperson), who has appeared in print for the New York Daily News, U.S.A. Today, U.S. Daily review, SOCIAL Magazine, and the New Jersey State League of Municipalities Magazine. 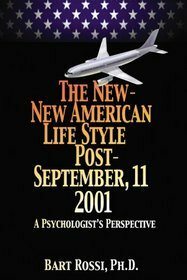 Dr. Rossi is NJ Licensed Psychologist and the author of The New-New American Life Style: Post September 11, 2001, A Psychologist’s Perspective (Dorrance Publishing Co., Inc., Pittsburgh, PA 15222 Dec 2003), The Effect of Word Anagrams High and Low in Association Value on Solution Times (The Journal of General Psychology, 1976, 94, 125-128), and Mediation Effects in Originality, Creativity, and Letter Frequency Hierarchy (Psychological Reports, 1975, 37). He began his career providing psychological care to a wide-range of clientele — through private practice, medical centers and other organizations, state-wide. From 1977 to 2013 he oversaw 50 licensed psychologists as C.E.O. of the Rossi Psychological Group, P.A., Somerville, New Jersey. He has served as co-Director of the Independent Child Study Teams, Inc. in Jersey City, and also as Director of the Adolescent Counseling Center of Somerset County. In 1977 he founded the Rossi Psychological Group, P.A, where — as CEO — he oversaw a group comprised of over 50 licensed psychologists and medical professionals possessing expertise in specialized clinical areas. The Rossi Psychological Group then became an affiliate of Vericare, the largest behavioral health company in the U.S.
Dr. Rossi received his B.A. in psychology at Parson’s College, (Iowa), M.A., in clinical psychology at the University of Dayton (Ohio), M.A. in General-Theoretical psychology at Fordham University, (NY) and his Ph.D. in General-Theoretical Psychology at Fordham University (NY). He is a member of the American Psychological Association, New Jersey Psychological Association (former board member), and the New Jersey Association for the Advancement of Psychology (former chairperson). He is married, with two daughters, and lives in Basking Ridge, New Jersey. He enjoys skiing and golf.